The Ventilator is pneumatically powered, single-circuit, volume-constant, time-cycled. It utilizes a high-pressure drive with regulated, high internal resistance to control pressure and is considered a non-constant pressure generator. Simultaneously, the Ventilator produces a flow pattern that is constant in spite of changes in lung mechanics (inspiratory square-wave). 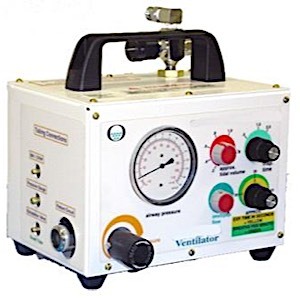 Originally designed, tested and utilized for military field work, the Ventilator is able to be used in ly any demanding environment such as In-Hospital Transport, Air-Mobile Operations, Special Treatment Areas, Operating and Recovery Rooms, Animal Laboratories and Veterinary Medicine. The Ventilator is designed with internal simplicity for operations and maintenance. Quick connect features allow the operator to provide for all necessary clinical situations: controlled ventilation, continuous-flow intermittent mandatory ventilation, constant positive airway pressure, as well as being adjustable to inspiratory/expiratory ratios that are infinitely variable. A wide-range pressure relief valve allows for both the prevention of barotrauma and time-cycled, pressure-relieved ventilation. In standard use, the Magellan Ventilator can be used in conjunction with a variety of face masks, cricothyroid tubes, endotracheal and tracheostomy tubes. Humidifiers and air/oxygen blenders of various types can also be used, as the operator finds necessary. Here are just a few of the demanding work environments where the Ventilator gets the job done. CAUTION: Federal law restricts this device to be used by or on the order of a physician.